I travelled to Berlin for 10 days with Zareta in Dec 2014 for a New Year's trip. We watched a spectacular NYE fireworks display on Oberbaumbrucke bridge and took part in all the firework action too. One of our main reasons for visiting Berlin was to experience the nightlife that we've heard so many good things about. We partied for days straight and loved every single minute of the insane nightlife culture. We also met up with some friends who live in Berlin; we experienced local family life with our friends Paul and Andrew who took us ice-skating and bar-hopping. We also met up with another friend, Wolfgang, over coffee. As an ex-East German Radio DJ, he recounted some of his interview encounters with famous political figures like Fidel Castro, as well as his stories from the days ofWW1, WW2, and the rise and fall of the Berlin Wall. All in all, Berlin is an amazing city deeply rooted in history and culture, and has one of the sickest alternative scenes in the world. I enjoyed every single second of being immersed in Berlin's creative and vibrant energy, and I know I will be back very soon! 'Mitte' is Berlin's city centre. You should spend some time walking around this area. You will find lots of museums here, including main attractions like the Berlin Cathedral. The walking tour covers most of the sites in Mitte. This is probably the closest you can get to understanding how it was really like to be a German civilian living during World War II. Berlin Underwelten provides different tours, taking you under the city and through the underground bunkers/ air-raid shelters. It provides a great insight into how people lived during the time of WWII, highlighting innovative techniques such as using Phosphorus paint to make cell walls glow in the dark during power failures. Berliner Unterwelten Tour 1 was interesting, insightful, and impactful - I loved every second of it. The Underwelten Tours booth is right outside Gesundbrunnen U-Bahn station., a ~15minutes train from central Berlin (Mitte). You can buy tickets on the day itself, or buy tickets via their website. They offer the tours in multiple languages. The main attraction about the Reichstag Building is the Dome's interior architecture. Unfortunately, I did not have time to visit this as I did not book in advance. Click here to book your place at least a few weeks before your trip. ·This is the German History Museum located in the Mitte area. This museum showcases the A-Z of Germany's history: pre-WW2, WW2, and post-WW2. I was especially excited about visiting this museum so that I could revisit some of the stuff I learnt in my History classes back in Secondary School. It was cool seeing Mein Kampf (Hitler's biography) and war-time Nazi Propaganda posters - the stuff that you only really see in history textbooks. There are loads to see in this museum. You might have to set aside an entire afternoon/ morning for this! Learn about the Jews and their customs/ beliefs, Jewish history, anti-semitism in Germany and The Holocaust, etc through permanent and special one-time exhibitions, as well as short films and interactive elements. Highly educational, thoughtful and enjoyable. Located a 5-10min walk from train stations: U1, U6 Hallesches Tor, or U6 Kochstraße. I had to queue for an hour the last time I was there. Be sure to get there early to avoid the queues! East Side Gallery is a 1.3km stretch of Berlin wall painted by international artists. Located next to Warschauer Straße station, this open-air collection of murals on the themes of freedom and peace is free to visit. To put it very simply, East Berlin (and especially Kreuzberg) is the industrial, rustic and hipster area of Berlin City. Expect to see graffiti-filled streets, street art, art studios, little cafes, bars and independent food joints. This is a really nice area to walk around in the day (remember to bring your camera along!). This family-friendly park is great for people-watching and for taking a quick break away from the hustle and bustle of the city. Currywurst is a classic German street food: German bratwurst (pork) sausage drenched in curry ketchup sauce (curry powder, ketchup, Worcester sauce), dusted with more curry powder; served with either chips/ fries or a bun. A must-try for every first-time visitor to Germany. You can easily find a roadside stall selling these savoury bites for about €2-5 per plate. Currywurst enthusiasts can also visit famous currywurst food stalls around Berlin such as Curry 36, Konnopke's Imiß. Burgermeister is located in a random, unassuming plastic box (max 20-30 people capacity) covered with graphic labels and stickers under a bridge in East Berlin. Quirkiness aside, this was the best burger I had in Berlin! I have recommended this to all my friends who have visited Berlin and they still can't stop raving about Burgermeister till today. 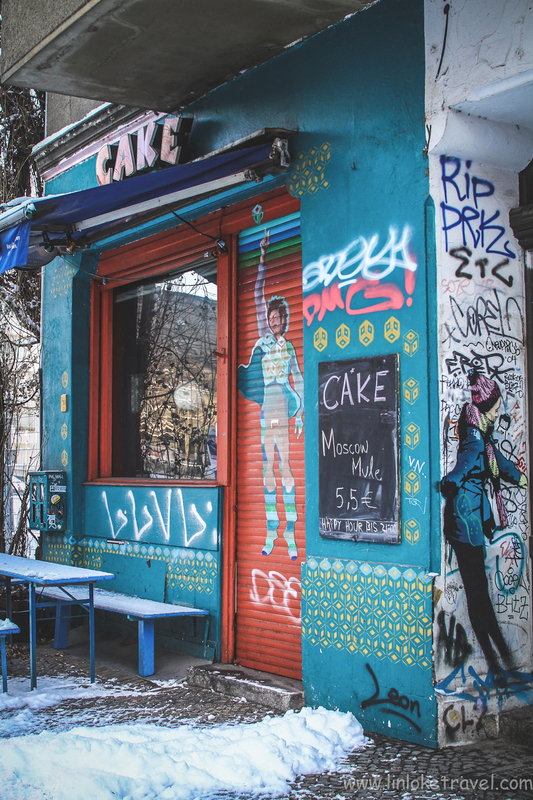 My favourite nightlife area in Berlin is in Friedrichshain-Kreuzberg, just north of the river. The closest station is Friedrichshain/ Warschauer Straße station. Here you will find a cluster of clubs and bars in a derelict train yard. The clubbing culture in Berlin (and especially in the Friedrichshain-Kreuzberg area) is slightly more 'grungy'. Dress code is casual - think sneakers and jeans. Entry is not guaranteed in most Berlin clubs either. Entry is very much dependent on the bouncer's mood and choice. You may queue for hours to get to the front of the queue, only to be declined entry by the bouncer by the main entrance of the club. Suicide Circus is a very popular local club for 20-35 year olds. It is a medium-sized club with two dancefloors, one playing German/ English pop-rock songs, and another playing German Techno. There was a confetti party happening when I was there - 100KG worth of confetti rained over our heads while we danced the night away to German Techno! If there is only one nightlife venue you should visit, it would be the vibrant Neue Heimat. I was pleasantly surprised when I chanced upon this food, music and dance venue in an abandoned train shed. There was just so much going on - a DJ spinning some house-techno in a corner, and people enjoying oysters and wine in another corner. I walked further down through the train shed and caught a glimpse of a Cabaret performance happening in one of the other rooms. Neue Heimat was probably one of my favourite nightlife spots in Berlin. Note the €3/4 Euro entrance fee to get into the Neue Heimat compound. Psst, don't leave Neue Heimat just yet! I chanced upon a 'secret' warehouse opposite the main Neue Heimat building where there were really good Jazz musicians playing proper Jazz music. Ambience was amazing. From my memory, I don't remember any door entrance signs so you might have to poke your head around to find this warehouse. A small-sized dark and mysterious club with two dance floors (one on each level). I loved the deep house techo that was playing when I was there. Chalet club is for proper house and techno lovers, with a heavy emphasis on the music - don't expect any glitzy decorations that most commercial clubs might have. Apparently the 'best' (and wildest) club in the world… You can try getting in but entry is not guaranteed. Berghain is known to be THE most difficult club to enter in Berlin. I stayed in Michelberger Hotel for 3-4 nights. It is located opposite Warschauerstraße station, and across the river from the nightlife area as described above. Apart from being the city's coolest hotel, Michelberger is also a famous nightspot in East Berlin. They have a Cocktail bar, lounge and outdoor courtyard. They sometimes bring in DJs to the lounge to play some old-school funk and R&B. There’s always something happening at Michelberger Hotel and I would recommend that you swing by if you are around the East. Access my Berlin Google My Map here.